SkinCeuticals, the innovative manufacturer of dermatologists recommended skin care products, has announced the launch of its new anti-aging serum. SkinCeutical's range of corrective serums welcomes the new H.A. 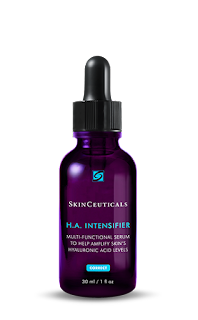 Intensifier, yet another concentrated formulation designed to improve the look of skin. This time, SkinCeuticals introduces a multi-functional serum formula that claims to help increase skin's own hyaluronic acid levels. Hyaluronic acid is one of the most powerful natural humectants, capable of binding and retaining up to 1,000 times its own weight in water. This skin-loving substance that is naturally found in our bodies acts as the body’s natural hydrator. This is one of the most beneficial skin care ingredients for all skin types, a first-class hydrator that has powerful anti-aging properties. When applied topically, hyaluronic acid helps the skin to replenish its vital, plumping moisture. 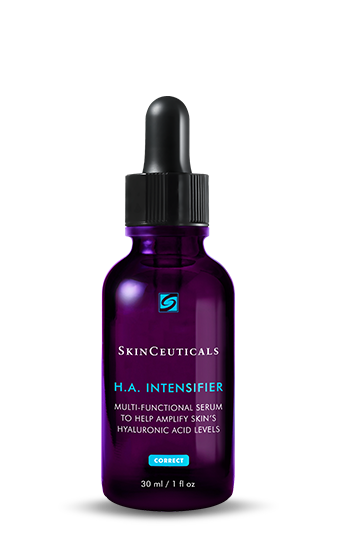 A boost of hyaluronic acid, delivered by SkinCeuticals H.A. Intensifier, enhances the moisture content of the skin, while also revitalising its outer layers, and improving the look of lines and wrinkles. It promises to increase skin’s own hyaluronic acid levels by 30%, in only four weeks. The formula is designed to prevent and correct the signs of ageing caused by the decline of naturally-produced hyaluronic acid. A special blend of ingredients works to provide superficial hydration while promoting the production of collagen and hyaluronic acid in the skin. As a result, the skin is more plumped, toned, refined, visibly renewed, and youthful. 1. 10% Proxylane – a patented molecule derived from beech wood that helps support skin’s matrix and restores water to skin. 3. Dipotassium Glycyrrhizate – a salt extracted from the licorice plant that reduces flaking and restores suppleness to the skin. ( This skin conditioning agent works to improve the appearance of dry/damaged skin by reducing flaking and restoring suppleness, and also functions as an anti-irritant with anti-inflammatory and skin soothing capabilities. In fact, clinical tests point to the ingredient as an effective treatment for atopic dermatitis. 4. Purple Rice Extract – rich in antioxidants, to protect skin by limiting the production of free radicals. The Purple, short-grain heirloom rice used in micronized Purple Rice is more widely known as Forbidden Rice, since only ancient Chinese emperors were allowed to consume it. It is packed with powerful nutrients of many types. 5. The purple colour, which comes from the presence of powerful phytonutrients known as anthocyanins, is the key to its powerful and unique antioxidant properties. 6. Purple rice has more proteins than white rice, and can have up to between 7 and 8.5 g of nutrients for each 100 g of rice, compared to only 5 grams in other rice strains. The SkinCeuticals H.A. Intensifier will be available from early February 2017. The serum is presented in a purple glass bottle with a pipette dropper. It retails at €90 for 30ml. Is this tested for safety?